"Every day is the same...wiping down yesterday's work and beginning again..."
"The hardest part of artmaking is living your life in such a way that your work gets done, over and over--and that means, among other things, finding a host of practices that are just plain useful. A piece of art is the surface expression of a life lived within productive patterns." "every day is the same...wiping down yesterday's work and beginning again, looking again....sometimes it's with hope, sometimes in anger, occasionally it's honest....new years, new days, all the same..."
Scott's simple words made me relax. I realized I needed to stop taking myself so seriously. The important thing is to just do the work with quiet humility and a certain amount of grace when encountering Life's inevitable chaos. It's not about perfection, or achieving a whole bunch of goals, or even creating finished paintings. It's just about living life, and doing the work. So, here I come New Year! Here I come, my beautiful Studio! A new day has begun! Thanks for reading my blog! Happy New Year! Happy New Day! 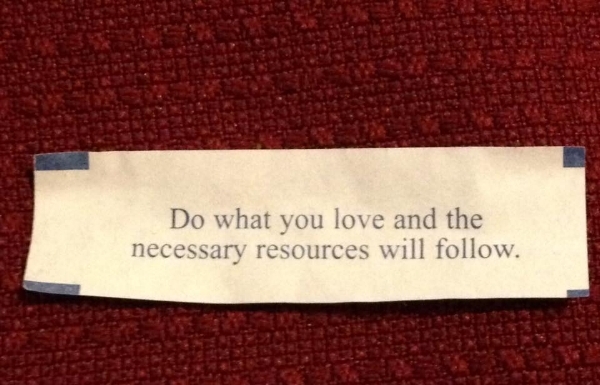 My New Year's Eve Fortune cookie!